Why Is Winter Air Dry to Begin With? We are not going to give you a full science class here, so don’t worry! Basically, you just need to know that colder air does not retain moisture that well. Have you ever heard someone complain in the summer that it’s not the heat, but the humidity, that gets you? That is because the humid air of summer retains more heat and that makes it harder for sweat to evaporate off of your skin! It’s all intertwined. In the winter, when the air outside is cold, there is just not going to be as much moisture in that air. Well, first of all, surrounding yourself with dry air is going to take a physical toll. Why? Because that dry air can leech moisture off and out of your body. Your skin may feel itchy and begin to flake. You may notice that your fingertips and knuckles are splitting. Cracked hands are painful, and they open you up to illness. So too does the drying out of your mucous membranes (yes, we know that sounds gross). If your nose and throat are very dry, then you are more susceptible to illness. 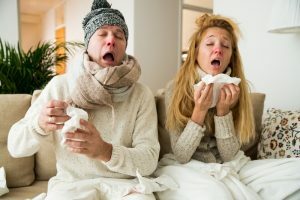 It’s not the cold of winter itself that makes you sick more frequently, it’s the physiological effect of the cold, dry air on your body and systems that gives germs the upper hand! This is not even to mention the problems that can develop throughout your home when the air in it is too dry. Wooden floorboards and furniture can crack. Paint can chip, wallpaper can split. Static shocks will increase, potentially damaging sensitive electronics in your home. Sounds like a great deal, doesn’t it? So what are you waiting for? Schedule your humidifier services with Mack Morris Heating & Air Conditioning. We can’t control the weather outside of your home, but we can control the weather inside your home.